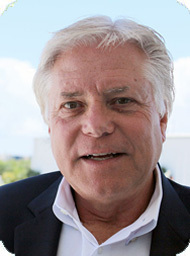 Yacht Broker Randy Kires : Atlantic Yacht & Ship, Inc. Growing up in upstate New York Randy learned early on that you have to make the most of a very short boating season. Early adventures started by camping and fishing the Finger Lakes, advanced to sailing the Great Lakes and then on to learning to navigate the Lock System of the Erie Canal and the St. Lawrence Seaway. A professional career in sales brought Randy South to the Mid-Atlantic States enjoying the coastal water of Virginia and the Carolina Coast. With the US Navy as a very large client a career high was participating in the sea trials and shake down cruises of two different nuclear Aircraft Carriers launched from the yards in Newport News, VA. Relocating to the Yachting Capital of the World Randy has enjoyed serving both domestic and International clients. In addition to Brokerage Sales, Randy has represented Ocean Yachts, Neptunus, Riviera, Contender and others. In recent years he has delivered many new Sunseeker builds as well developing new and repeat clients along the way. His years at Atlantic Yacht and Ship continue to be rewarding and like working with family.